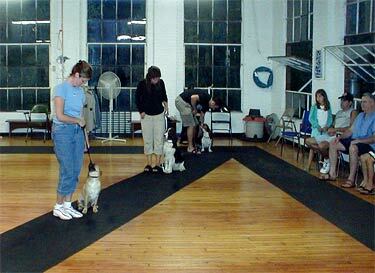 Each class will consist of seven, one-hour sessions for dogs 5 months and older. In fact, any age dog can attend. Sometimes the dog is trained when he is young, but after a few years, we let things slide and that's when behavior problems start. The whole family is invited to come. That way, the dog will not get confused with different methods, commands or hand signals. This is also considered a continuation of the puppy kindergarten class although your dog is not required to have attended one. Handlers are taught "doggie communication"
Train your rescue dog to be a well behaved, well balanced family dog in our specialized classes. Rescues come with all kinds of issues that are not common in a newly acquired puppy. This is similar to the Basic Manners class and open to all dogs 5 months and up. Here's a chance to develop your dog's skills to perfection. Dogs must have taken the Basic Manners to enroll. Off-lead work is introduced slowly for heeling, recalls and stays. Many distractions are introduced and getting a better response to all the commands is taught. Handlers and dogs are also prepared for the Canine Good Citizen test. Your AKC approved evaluator, Michelle Larson, will give the test at the end of the eight-week course, along with a graduation and diplomas. We offer 3 levels of classes for fun using regulation, standard size equipment. Beginners are introduced to all the equipment and simple sequences are set up. Intermediate and Advanced concentrate on accomplishing more intricate sequencing, body maneuvers and positioning for handlers. This six week course is a lot of fun!!! It is designed to entertain and stimulate your dog's mental capabilities by using his nose. Our classes focus on building enthusiasm in dogs for finding their toy or treat bag hidden in an obvious place at first. A lot of praise and generous rewards are used to encourage the dog to continue to use his nose to find the "hidden treasure." Later, we will be using different scents to have the dog generalize his ability to "find it". Handlers find that even shy or nervous dogs have their confidence built up because they have to concentrate on their "work". That's what Dog Scents is all about... giving your dog a job to do so that they have a purpose in life besides lay around and greet you when you come home! Thursday, May 16, 2019 at 6 pm. Basic Manners/"What Rescue Dogs Want and Need"
Monday, July 29, 2019 at 7:30 p.m.
Agility/Run thrus 4 weeks, Call or email for dates. *Pre-registration is strongly recommended as agility classes normally fill up quickly and space is limited.